Members of thé Swedish Royal Family, Queen Silvia, Crown Princess Victoria, Prince Daniel, Princess Madeleine attended thé Polar Music Prize at Concert Hall in Stockholm. Oh my! I just LOVE this dress on Victoria it's so pretty. I also enjoy her enjoying her husbands company too - so sweet these two. I can see Mr O'niell but not Princess Madeleine. Was he there alone? Clarification; Chuck Berry, one of the prize winners, has many years ago been convicted in for trafficing in the US. The World Childhood Foundation, founded by the Queen and Princess M's current work pkace, is woking on raising awareness about childrens rights and trafficking. They both took the decision to not attend the actual gala ceremony to make a statement as they feel very strongly about this topic however they did attend the banquet afterwards. 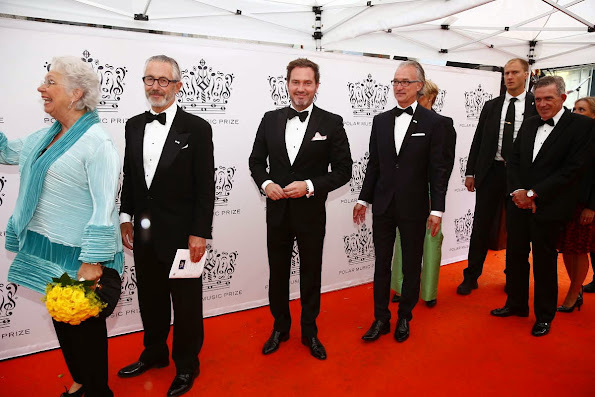 I think the royal family are some kind of patrons of the Polar Music Award, so they have to attend in some way. Victoria is so pretty in that wonderful dress! Like it more than Madeleines dress, I think it's a little too much of everything. But, apart from the outfits too, the two Swedish sisters are stunning lady's!